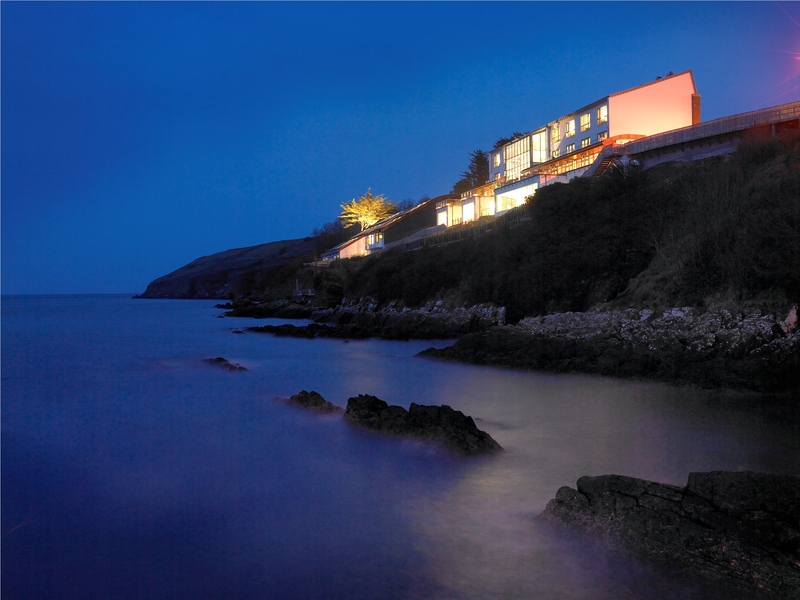 The Cliff House Hotel is aptly named – there it is, improbably stitched onto the coast, overlooking the popular picturesque summer resort village of Ardmore, West Waterford. The Cliff House has been at the forefront of national hotel attention since its opening in the late Noughties, garnering for itself in the meantime a wealth of acclaim, positive reviews, awards and stars (notably in the on-site House Restaurant, which nabbed a Michelin star last year). It is a unique building courtesy of its design and architecture, and is distinguished by many things – most notably, perhaps, its 39 rooms, which manage to be down to earth while simultaneously exuding subtle, generous luxury. The hotel’s GM is Adriaan Bartels, one of Europe’s most highly regarded, whose presence guarantees an unruffled and utterly rewarding hotel experience. 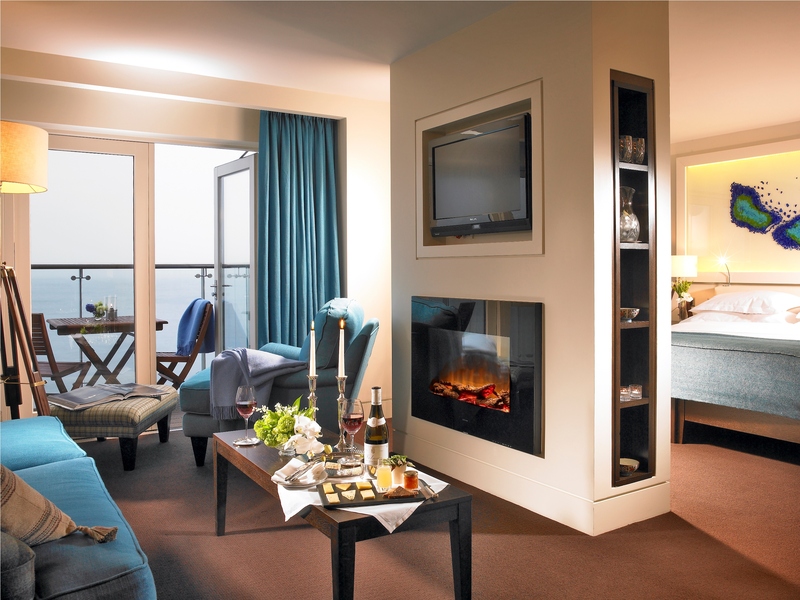 We stayed in a very spacious Cliff Veranda Suite that had wide-open views of the Ardmore coast and the Irish sea. There is surely little more comforting than looking out a window upon a raging swell of tide and surf and being cosseted by warmth, cool décor, original artwork, and a split-room with two massive television screens and two faux log fires (admittedly, not as good as the real thing, but, hey, you can’t have everything). The division between the bedroom area and the bathroom was smartly conceived and executed, and like the best of their kind sent you off home with appropriated ideas for your own. Bathrooms are generously proportioned, and come with one of life’s ultimate self-indulgent treats: the undeniable luxury that is underfloor tile heating. Speaking of self-indulgent treats, let me tell you about the food. The entrance to The House Restaurant is via a spiral staircase leading down from the reception area, and while the room is casual and comfortable (once again, with those great sea views) there is little about it that is exceptional. The food, however, is just that. Dutch Head Chef Martijn Kajuiter comes from what has been termed the ‘Tower of Babel’ approach to restaurant cooking: many dialects, many influences, and many contemporary gestures. In lesser hands, such a mix could turn nasty, but Kajuiter – the recipient of a Michelin star – manages to turn potential conflict into something so original and taste-bud beguiling it’s quite amazing. Location is important here. The Cliff House Hotel is set most assuredly on a cliff face that most certainly looks out onto the ever changing vista of the sea. Even during the winter months, there’s a pull to come here; this is possibly due to the fact that there aren’t too many happy summer campers around. The major appeal of this is the sense that you have the location, and therefore the hotel, all to yourself. Despite the occasional sparse atmosphere in the winter months, there are quite a few things to keep you occupied. As you leave reception for your room, you’ll notice a range of wellington boots lined up alongside the natural slate walls of the hotel. These wellies are not for decoration, but rather a means to experience the cliff walks, which are minutes away. A short walk, also, into Ardmore will bring you to a lovely, widespread beach (complete with sandcastle-effect public toilets, no less) that affords lovely views of the surrounding area. 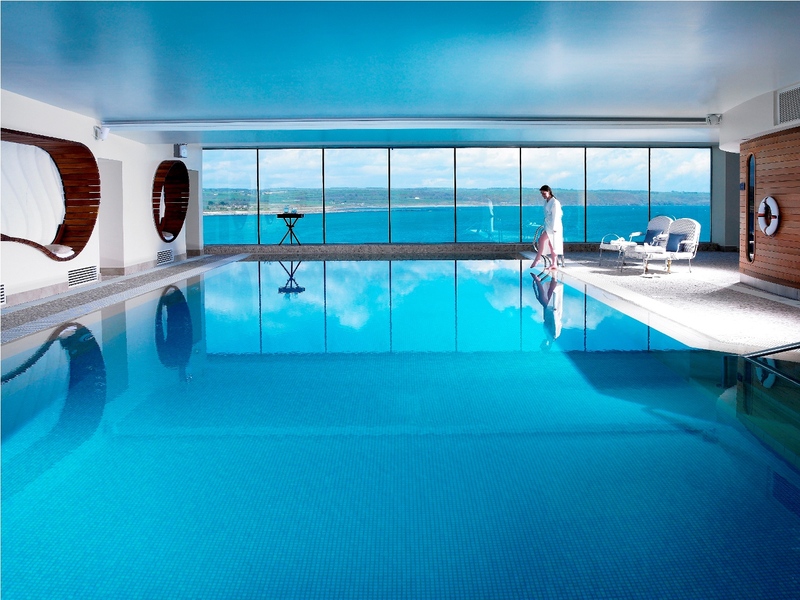 If the weather is too poor to wander outside, fear not, as the hotel has a quality spa and leisure centre that will certainly wile away a few hours. If the weather is too poor and you still wish to embrace the elements, then you can always use the outside jacuzzi. A glass of champagne is optional. The location of the hotel is quite unique and most impressive, and architecturally it’s clearly the result of a mixture of daring and innovation. We love the walls throughout the hotel that were (painstakingly, no doubt) constructed with slivers of slate, and we think the hotel’s commitment to using Irish art throughout is as sensible as it is commendable. Is there anything we didn't like? Well, the hotel is constructed in such an unusual multi-level/split manner that it takes more time than usual to find your way around. In this regard we were also confused by the signage. And in the rooms (well, our room, at least), the selection of books seemed to be exclusively geared towards American visitors, and seemed to take willful delight in not having any author whose name you might even vaguely recognise. HOTEL DETAILS: Cliff House Hotel, Ardmore, County Waterford.